The tools available at this free site allow you to experiment when creating a floor plan of a preschool classroom without moving one piece of furniture! The site is easy to use and lots of fun, giving you the freedom to create, rearrange and start over as many times as you would like. The site has the capability to save several of your layouts on the actual website, but will only be available on the computer you create the layout with. If you would like a hard copy for your own use, simply click on the "print" button and you will have a map of your preferred layout. This is one of the easiest floor planning websites to navigate, with its drop-down menus and extensive shape database. You can choose to place circular or square rugs, round tables, student desks, sinks, refrigerators and many other typical classroom furniture within the classroom. You can create a floor plan for any size classroom you like, simply enter the dimensions of the room into the drop-down menu and the site will automatically adjust the room template to meet your needs. The template above was created using the software on this website — click on the image for a closer look. As you can see, there is a circle rug for class meetings in the back corner, along with a small book stand. The dramatic play area is located directly underneath the circle time area, giving children lots of room to spread out in this center. The room is arranged in such a way to maximize space and provide lots of open floor space for children to use. The art and easel area is located near the sink for easy clean-up, and the manipulative and block area is closed in with a large rectangular rug and two low shelves. Three round tables are placed near the sinks to serve as snack or lunch tables as well as a place for messy art or sensory projects. 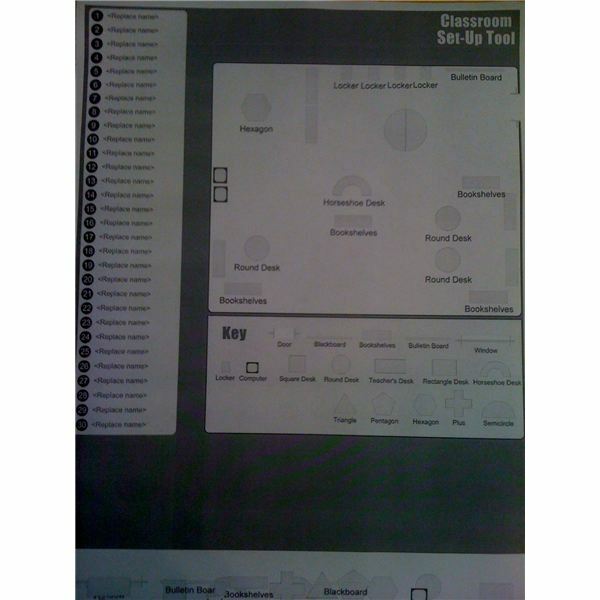 If you want a simple, no-frills way to create an easy room plan, the classroom architect site is stellar. You may know the Scholastic company as the folks who provide your school with inexpensive books through book clubs and book fairs, but they are also an invaluable teacher resource. Just a few minutes browsing their website will show you just how dedicated they are to making teacher's lives easier. Their classroom set-up tool provides just the right tools you need to experiment with creating a floor plan of a preschool classroom without any heavy lifting. The tool provides you with options for the shape of your classroom, but does not take into account the exact size of your room, so you will need to be mindful of that before you begin using the site. The set-up tool seems to be aimed more at elementary school teachers, but if you have a bit of an imagination, you can make it work for your preschool classroom. There are several menus to choose from to begin your room arranging, including desks, basic shapes and room furniture. There is also a way to insert doors and windows into your room template, an option the architect website did not offer. There are many different shapes to choose from when using the Scholastic tools, including horseshoe desks, bookshelves and computer monitors. Scholastic also offers a place to enter student's names and other information right on the room template, just on the left side of the page. You have the option to print your finished room plan, but there isn't any way to save it to the Scholastic website. The above floor plan of a preschool classroom was created using the software on this website — click on the image for a closer look. There is a bulletin board and lockers, or cubbies, near the entrance door, as well as a circle time area. Near the back of the room are two low shelves, and a hexagonal table to be used for art and sensory projects. Along the back wall of the room are two computer monitors and more shelves and a round table for manipulatives or writing. 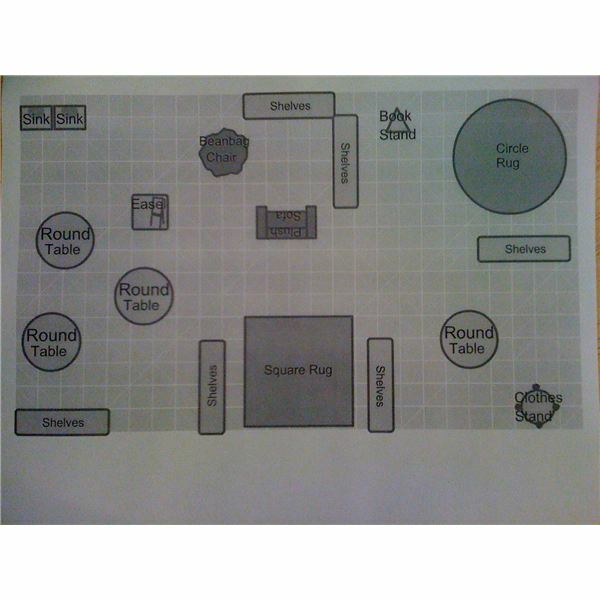 This room layout is much more spread out than the earlier template, and allows total visibility of all centers from any point in the classroom. While this room layout is much more minimalistic than the previous one, it contains all of the basic center areas you will need for setting up a preschool classroom. Your imagination is the only thing between you and the classroom you have been dreaming about. And the tools on these websites will have you arranging your classroom in no time!